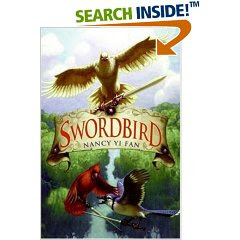 Jenny found a review of Swordbird through the American Girl magazine which highlighted the young author, Nancy Yi Fan, in one of their articles. Nancy Yi Fan is a twelve year old girl who had a dream about birds going to war around the same time as 9/11. Grappling with the issue of war, she decided to work out some of her thoughts, ideas and imaginations in the form of a book. Enter: Swordbird. Jenny was really interested in reading the book, I think especially as it was written by a twelve year old, and so we found a copy at our local library. I decided to read it as well. It seems like every so often a book receives recognition not so much because of the story, but because of some unique aspect and/or attribute of the author. In this case, fame is coming as a result of her age. However, I do think the story is worthy of some attention. I think the book is fanciful, captivating (esp. for the age group it is directed at! ), not to mention very well illustrated. I can very easily see them taking this story and making into a Pixar movie of some sort. The main theme of this book is that peace is better than war. In an age where everyone is crying for peace, this book hits the mark. Still, I am very satisfied with the irony presented in this book (and around the world) that would suggest that peace can come without war, while relating tales of conflict. Any good story comes through and out of conflict. Conflict inspires even though it might not be pleasant and/or welcomed. This is a convenient truth, given the fact that we are all humans and live in a fallen world. Conflict will always exists and thus, good stories are still waiting to be birthed. Nancy Yi Fan simplifies the "peace" message a bit for her audience. The message is strong and present and is there for discussion purposes. (Which is why I speculate that this book will be snatched up by a movie producer somewhere, sometime.) She is also, by the way, writing a prequel that is due out in January 2008 entitled, Sword Quest. You can be looking for that also. From a Christian standpoint, my take on this book is that it would provide excellent oppertunity for anyone to talk to their teen about God's omniscence and omnipresence. In this book, the bluejays and cardinals are calling out for Swordbird to come and save them from the villan, an evil hawk. In order to have their savior come and do the saving, they must find a magical stone as well as have two verses of a song. Gods (little "g") have frequently been called upon throughout the ages to come and save people. This book reminded me of Elijah on the mountaintop, covering the alter with water and crying out to his God who instantly sent down fire from heaven to prove Himself and make Himself known among the people. I'm grateful for a God who is always there when I call on Him. Even when I do not call out, He is there. He never leaves me, nor does He forsake me. He does not demand that I accomplish various tasks before He will listen to me. He just does. Why? Because of love. Nancy Yi Fan definitely brings Chinese culture and lore into her story. It is very understandable why the story talks about the great spirit and testaments. I wouldn't let that stop me from reading the story, but I would make sure that anyone who is reading it understands the difference between a great spirit who needs some bribing in order to make an apperance and the God who is always there. There is a stunning difference between the two and I would merely suggest that you make that clear to your reader. Otherwise, this story is interesting, entertaining and it IS hard to tell that a twelve year old wrote it. It's worthy of some attention is, I guess, what I am trying to say. I'll let Jenny tell you her opinion now. 3. there were lots of "main" characters. She (Nancy Yi Fan) did a very good job describing everything and made it feel that you were actually "there". All though at some points it got a little gross at the battles (all battles are gross). One thing that bugged me is that it would say "Somebird" instead of "Someone" and "Nobird" instead of "nobody" and so on and so forth. But then again it does make sense. Between the two of us, we would recommend this book as an enjoyable read. For more information on Nancy Yi Fan and/or the book, you can click here. I was looking for a Christian perspective on this book before reading it with my children. Thanks for providing just that!